This album was re-released as If You Could Read My Mind. 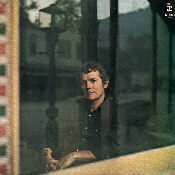 Canadian Gordon Lightfoot first began to gain recognition in the mid- '60s as a songwriter when his compositions "For Lovin' Me" and "Early Morning Rain" became hits for Peter, Paul & Mary, and Marty Robbins topped the country charts with "Ribbon of Darkness". Lightfoot's own style was understated, his tasteful folk arrangements topped by a gentle burr of a voice. His albums began to appear in 1966, but it was not until the start of the '70s that he became a big success as a performer, scoring in 1970 with Sit Down Young Stranger, which contained his hit "If You Could Read My Mind," a song with a typically flowing melodic line and gently poetic lyrics.